Here is an ADORABLE baby shower decoration idea sent in by our reader, Chris. 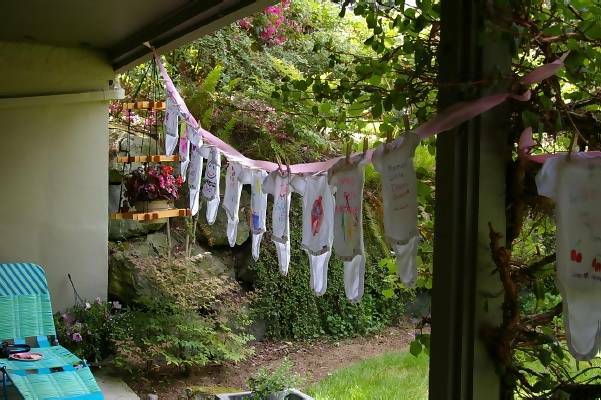 Onesie clotheslines are such a fun way to decorate. I love how she created an activity out of it. Chris used fabric markers for her onesies, but you can also use iron-ons or fun shapes of material that have been previously cut out for stitching or appliqueing on to the shirt. You can also add embellishments such as rhinestones for a fun look. The pictures are so fun! Thanks so much for sharing them with us Chris! Instead of a game I had Fabric Mate fabric markers from Joann's, white onesies by Gerber from 6 - 24 month sizes and some contact paper to back the shirts with. Everyone took a onesie and designed a special shirt for the new baby. Some even did a tie dye! The colors were brilliant and the contact paper made writing on the shirts as easy as writing on paper. Now mom will have good wishes and memories every day because we all know mommies love onesies. The pictures tell the story! Everyone loved the activity and mom loved getting 25 onesies! Some had some funny sayings for the backs too! The Clothesline Decorations Are So Cute!! I have been to a few baby showers where this was used as a decoration. It is so cute!! 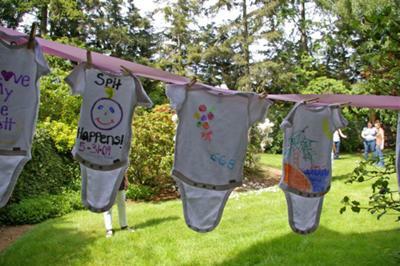 I think it is such a great idea to have the guests decorate the baby clothes. I am going to have to try it at a baby shower I am hosting next month. This has been a hit at multiple showers. We get a few onesies, shirts, etc. - for different ages (0-3 months, 6 months, etc.) and hang them on a clothes line. It looks really cute, but it is actually an activity. We supply paints and each guest creates a custom shirt/onesie for the baby to be - the Mom goes home with wearable art for her baby and baby has homemade clothes from everyone that was at their party. Join in and write your own page! It's easy to do. How? Simply click here to return to Baby Shower Decoration Ideas.